You are welcome to attend my classes for as long as you wish. Setting your sights higher will result in both you and your dog developing a greater bond.The better your dog gets, the more pleasure you'll both have. 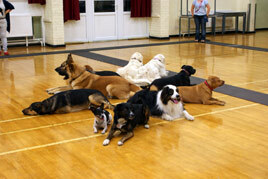 As with all my classes there is a variety of ages and breeds. 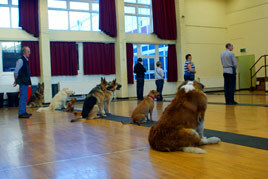 All the exercises are conducted off lead, and quite often with the dog some distance away from its owner. If it appeals to you to have greater control of your dog, come and watch one of these classes, it might just inspire you to try that bit harder, and get even more from your dog. You will get out what you put in, and often a lot more.